When it comes to Black women, whether it’s our dollar, our influence, or our vote, we hold enough weight to tip the scales and shift the conversation. If 70+ Black women from different backgrounds, professions, and industries, gathered to discuss our concerns, what would that room sound like? Last weekend I attended Cornrows and Cocktails to talk about the the most controversial element about who we are (other than our skin) - black hair. Afros, wigs, locs, extensions, tapered cuts, box braids, buzz cuts, pony tails and baby hairs filled the beautiful Shell loft in Williamsburg, Brooklyn. Upon entering, guests were greeted by the soulful sounds from Solange's "A Seat at the Table". The sun beamed through the tall windows onto hairbraiders who styled beautiful afro-hair into halo crowns and unique updos. Guests talked amongst themselves, extended arms captured the perfect selfies, and long lost Instagram friends exchanged hugs and kisses. Needless to say, we walked straight into Black Girl Magic! When they say "Necessity is the mother of all invention", make sure you ask Denequa Williams and Briana Owens! 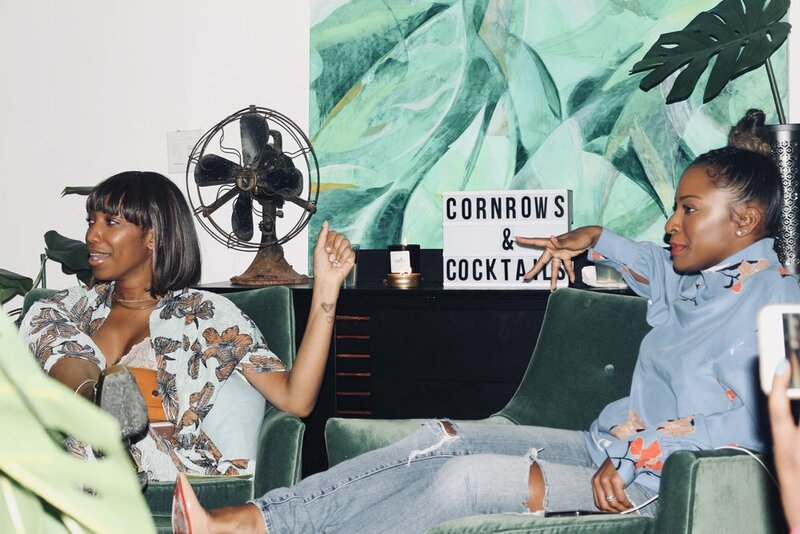 The ladies behind the Lit Brooklyn and Spiked Spin lifestyle brands invented a safe space for Black women to explore how we really feel about how we wear our crowns. Briana asked Denequa and other women from 6 different group chats if they knew how to cornrow and every Black woman said they didn't. One text thread spread like wildfire, creating the idea of the Cocktails and Cornrows event. Hair in the workplace and what’s deemed “professional” had been an issue of several women who sat with us at Shell’s Loft. In February of 2019, the NYC Commission of Human rights placed new guidelines in their laws. The targeting of people based on their hair or hairstyle, at work, school or in public spaces, will now be considered racial discrimination. These revised guidelines have only confirmed the experiences of Black women in Corporate America and what its like to feel targeted at work. While comments from colleagues might be flattering to some, very often are they received as a nuisance. One woman from Atlanta took initiative with her non-black coworkers by hosting Lunch N' Learns at work. She said "By getting ahead of it, you deal with it less. I am a Black woman, my hair is prone to change every 2-3 weeks!" An unexpected topic of discussion was Ms.Belcalis Almanzar, also known as Cardi B. It's no secret that Cardi B is a Black Afro-Latina with her mother from Trinidad and Tobago and her father, Dominican Republic. I'll admit, there's a little Cardi B in all of us okurr, but some of us didn't think she'd make it with her boisterous, loud Bronx, New York attitude. Our beloved Cardi has made her way to covers of Vogue and Vanity Fair, graced Grammy Award stages, and onto photo shoots with Madonna. Though many of us thought she would have to filter herself in order to be accepted, her unfiltered personality has been glamorized in non-black spaces. Non-blacks looking to relate to the culture of the black woman, often imitate Cardi B. While we are all striving for our own versions of Cardi B’s successful year, it seems as now we have to extend our efforts to avoid falling into the Cardi B stereotype created by mainstream media. We are not all like Cardi B, not all black women are created equal. A pivotal moment during the discussion was when hairstylist Nikita Gibson asked the group whether they've been in safe-space circles like these before. While several hands were raised, many others were not. Living in New York City grants us the privilege of having access to Black Women. Our space and time is not available to everyone and hairstylist Reece described what it's like sitting in on these conversations. She had just left a similar discussion in Philadelphia and told us that many of the things she heard in Philly were echoed in that room in Brooklyn. " There's a reason why some of us have heard this all before. Black Women like pain. ", Reece said. The room buzzed in "hmmms" and no one could object. Women of color would rather talk about our struggles, exchange our stories but rarely do we ever seek healing. Reece's sentiments were a catalyst to bring other issues to the forefront such as Black women judging each other and inner resentment towards other women of color. Public figure Scottie Beam, shared her feelings towards those of Afro-Latino descent as she described her experience growing up dark-skinned with curly hair. I shared a personal experience as a child being shamed for not wearing my hair relaxed. I was headed to the 6th grade when a classmate told me I was overdue for a relaxer. Comments like these are not random or spontaneous. The conditioning of what is "good" and "bad" hair begins in the home, and with the majority of women in the room being the descendants of immigrants, it was obvious that some of what we've been taught are the results of deeply rooted ideas about what is acceptable in society. Women grew up thinking curly hair was associated with poverty and low social status. Sadly, I spent the entire summer begging my mom for a relaxer and eventually she gave in. Thankfully, the peer pressure I received as a kid occurs less and less these days. With the influence of the natural hair movement in the past couple years, kids are no longer begging their mothers for relaxers. Women are wearing their hair natural and showing the younger generation that we are beautiful without any additives. Representation matters, not only for the kids but the adults too! Without platforms like Youtube, Instagram, Tumblr, etc it'd be difficult for us to be seen. What a time to be alive where we can make our mark in publications, TV, social media, and Hollywood. Our presence matters simply because no one can tell Our stories better than we can. It's our responsibility to instill great values in the generation following in our footsteps. There is definitely a lot that can be said about Cocktails and Cornrows. It was a safe space, a town hall, an open forum for Black women and men to expand on topics that are usually discussed behind closed doors. I imagine to to live a LIT and SPIKED life, one must be brave enough to have their voice heard. As vocal advocates for people of color, I'm thankful that Shell of Shells Loft, Denequa of Lit Brooklyn and Briana of Spiked Spin were able to join forces to create a genuine atmosphere for transparency and an unlimited dose of Black Girl Magic. I hear there's a Cocktails and Cornrows part two coming soon! I absolutely look forward to attending. Tier NYC Hosts Their 1st Annual ARTrepreneur Fest!